Kymmenes FDC-diabolojongleeraustapahtuma on ohi. Tapahtuma pidettiin 14. -16.8.2015. Suomen ainoa diabolojongleeraukseen keskittynyt tapahtuma kokosi osallistujia kymmenestä maasta ja neljältä mantereelta idylliseen kyläkouluympäristöön Oriveden Eräjärvellä. FDC:n ajatuksena on tarjota suomalaisille diaboloharrastajille mahdollisuuden oppia parhailta ja nähdä mielenkiintoista diabolojongleerausta. Suomalainen nuori diabolopolvi on tällä hetkellä Euroopan kovatasoisinta. Muualla Suomessa tai Euroopassa ei vastaavanlaista tapahtumaa ole. 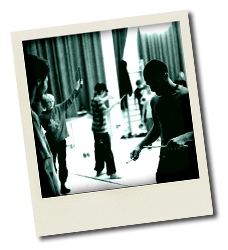 Alexis started to play diabolo on a student evening when he was 20 years old. A friend brought a diabolo, and Alexis played it all evening long. The next day, he bought his first diabolo. He developed his skills in the following years while training in his backyard. 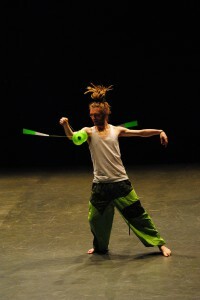 He discovered different ways to play the diabolo but developed a strong interest to the ‘vertax’ technique. This is the way to practice the diabolo horizontally. Alexis is known for his unlimited creativity and imagination in this diabolo discipline. 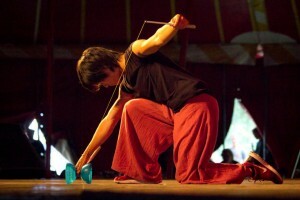 He pushed boundaries even further by starting to play one diabolo horizontally and another vertically in the same string. He developed this spectacular technique entirely on his own. 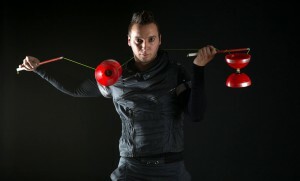 In 2013, an international forum of diabolists decided to call this the “Galexis”, named after Alexis because this way of playing the diabolo was never seen before. That same summer, he met Tony Frebourg, who would start coaching him and who would truly stimulate Alexis to go on stage and share his exceptional gift. He performed for the very first time in March 2014 and has amazed people all over the world, ever since. FDC2015 -festivaalilla Alex tulee esiintymään gaalassa ja pitämään työpajat sekä vertax-tekniikasta että durendal-tekniikasta joka on yhdistelmä vertax ja normaali tekniikasta. OJJ is 8-bit electro producer, DJ and a chiptune artist. OJJ’s music is filled up with aggressive bass lines and the music itself flows in the deep underground swamplands – basically it’s chiptune, basically it’s not. OJJ’s sound may remind of 8-bit chainsaw, trip to the mountains or space or just a basic hangover, it’s your decision! 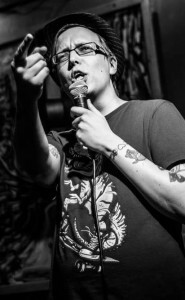 “Straight out of East London, Arthur Hyam sets out to to inspire and captivate with his variety of skills. 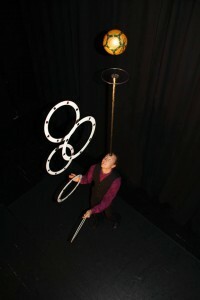 After Diaboloing recreationally for years Arthur decided to enter the social and professional side of juggling in 2013. Since then he’s taught and been a regular attendee at the weekly Spinning@ gatherings in London. Taking inspiration from jugglers, spinners and flow-artists of all kinds Arthur has incorporated many different techniques into his unique laid-back style. Taking on these newly found skills from other disciplines Arthur went onto win the title of British Young Juggler of the Year at BJC in 2014. 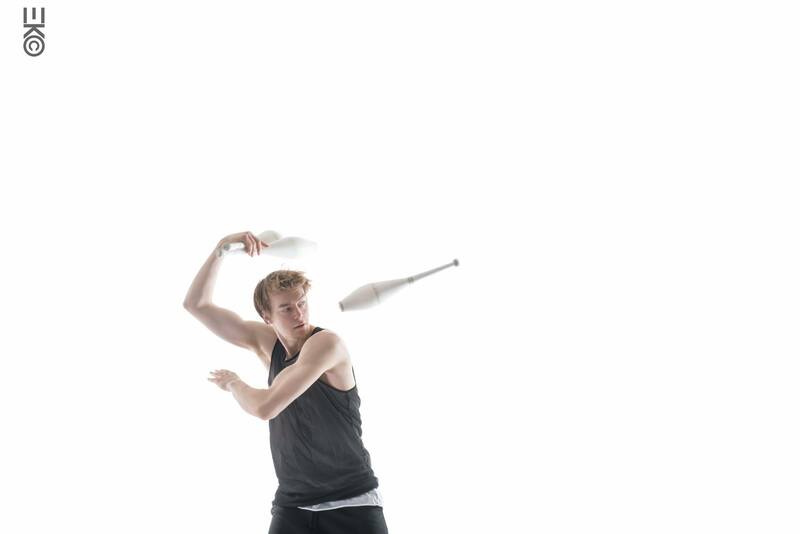 In this new year he puts forward a brand new flawlessly flowing 1 Diabolo routine that he’s already showcased all over the UK and now he brings it to Finland for the legendary FDC! omalaatuisen persoonansa sekä erittäin korkeatasoista tekniikkaa, joka hämmästyttää katsojia joka kerta. Hän on myös yksi kahvakuulajongleerauksen maailman edelläkävijöistä. 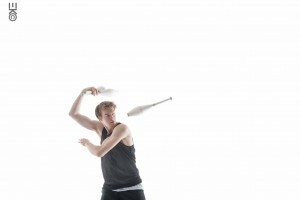 Onni Toivonen has lived for 21 years, 13 of which juggling and 7 specializing in club juggling. Hailing from cold, dark Finland, the pursuit for his dreams of being a professional circus artist has brought him all the way to cold, dark Sweden. Onni wishes to push the limits of his art form and the capabilities of his mind and body in order to give something back to the world where paying your rent by throwing plastic things is possible. Heikki Multanen on juuri aiheettomasti potkut saanut pitkän sirkushistorian omaava taiteilija, josta tulikin yllättäen katkera keskivartalolihava perheenisä. FDC:ssä Heikki tulee yllättämään kaikki rantasaunalla lauantai-iltana. Tätä settiä ei kannata jättää väliin. 2011, Stephen Langley (UK), Donald Grant (Skotlanti). 2010, Pranay Werner ja Markus Springer (Saksa) sekä Stephen Langley ja Tom McCall (UK). 2006, Eric Longequel ja Antonin Harz (Ranska).